The Scythe often points to a clean break, a sharp ending. It can occur quite suddenly and without warning. It can range from cutting away something troublesome to ending a relationship. The cut will come fast, and will be based on logic. Emotions will not factor into it. When a decision is made under the influence of the Lenormand Scythe card, the decision is almost always permanent. Remember that even though the Scythe warns that something is about to happen, it doesn’t necessarily mean danger will occur. Not all cuts are bad. For instance, the querent may be removing something from his/her life that is no longer useful. Note: By itself, the Scythe does not indicate physical death. No individual Lenormand card means an actual physical death will occur. The Lenormand Scythe Meaning in Love: In love readings, the Scythe usually means a relationship is coming to an end. It isn’t a positive card to see between two people in a Grand Tableau or any spread for that matter. 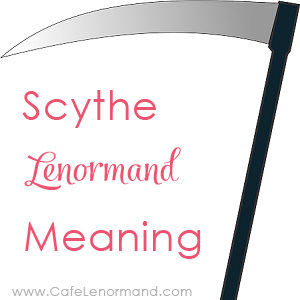 The Lenormand Scythe Meaning for Career: The Scythe can indicate job loss, turning down a job offer, or a reduction of hours. In terms of a job, the Scythe card can represent a surgeon or dentist. The Lenormand Scythe Meaning in Health: Sometimes in health readings, the Scythe indicates surgery. It may also represent problems with the teeth or the mouth. Using the Scythe for Timing: The Lenormand Scythe card means October, 10 days, 10 weeks, or 10 months. If the Mountain or Lily are present, they will add delays; it can be 10 months or longer. What is no longer serving you in life? Where do you need to be more cautious? Is there something you need to let go? How do you deal with sudden change? What event, or change, is about to be announced?